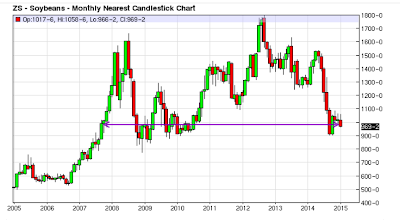 Mish's Global Economic Trend Analysis: Asset Price Deflation Coming Up? Food Prices About to Drop? 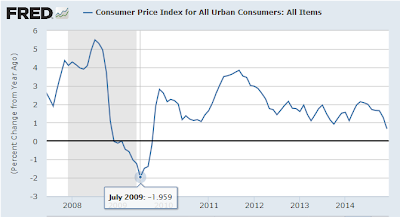 CPI About to Go Negative? Credit Deflation? 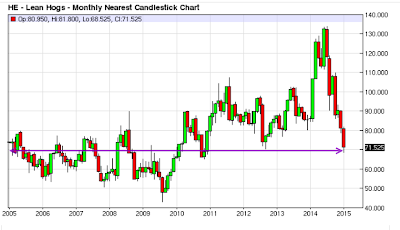 Asset Price Deflation Coming Up? Food Prices About to Drop? 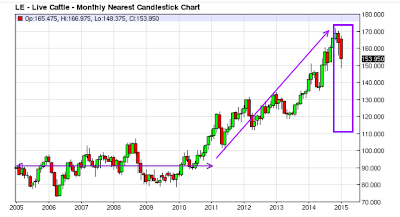 CPI About to Go Negative? Credit Deflation? 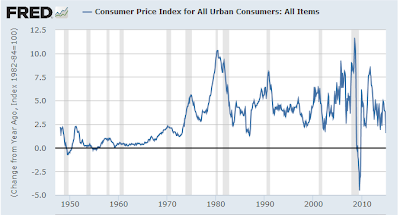 Inflationists claim that is a trend to oblivion. And actually it is. But it's a slow trend towards oblivion with intermittent disruptions as the following chart shows. 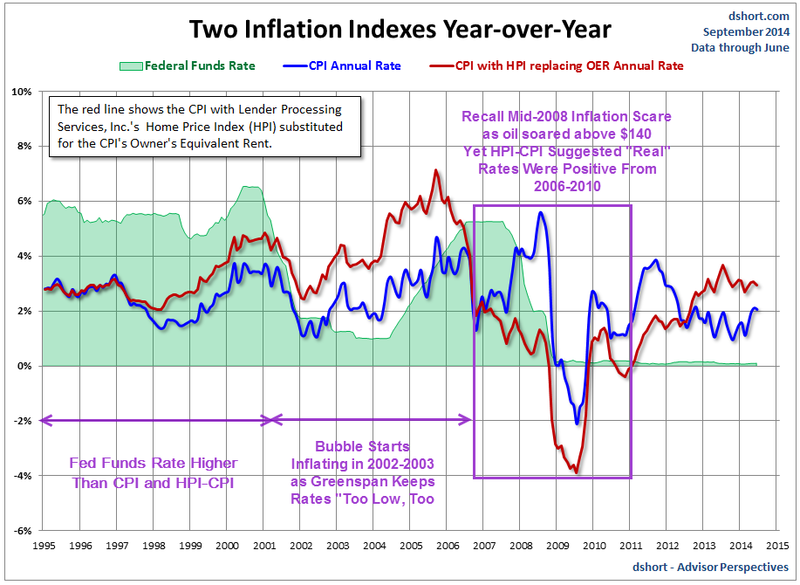 As measured by consumer prices, inflation went negative from December 2008 until October 2009. 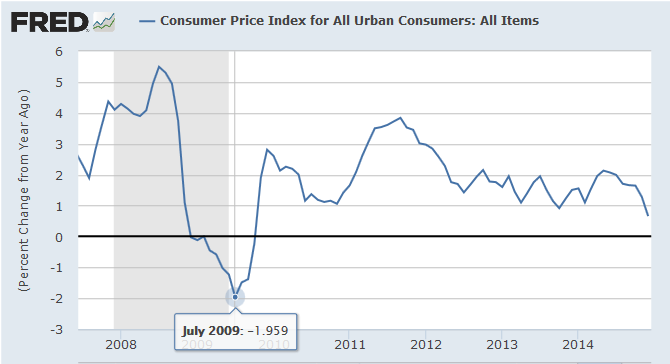 The CPI hit a record low of -1.959 in July of 2009. My prediction made in 2005 or so, was and still is "The US would go in and out of deflation a number of times over a long period of time". I was speaking in terms of "credit deflation", but that occurred as well. Either way, I was correct and the inflationists who predicted hyperinflation before deflation were simply dead wrong. I got to thinking about this again recently given the plunge in oil. Let's take a look at oil prices in relation to the overall CPI. 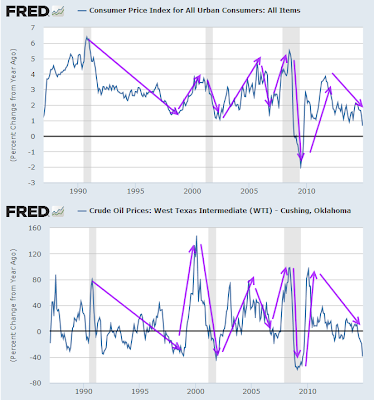 Clearly there is a correlation over longer periods of time but the amplitude of oil in both directions is much greater. That makes sense because housing is the largest component of the CPI, not energy. 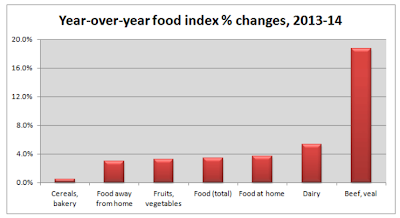 An article on Yahoo Finance on January 16 caught my eye and I bookmarked it: Yes, you ARE paying more for food. I am not here to dispute that chart. In fact I agree with it. Worse yet it has been persistent, especially with beef, and for more than a year. From approximately 2000 until 2010 or perhaps 2011, the sale price of prime rib was $4.99 a pound. Now the sale price is $7.99 a pound, if you are lucky. Pork is different though. I picked up center cut pork chops on sale last week for $2.49 a pound. That is roughly the same sale price for 10 years. I have written about this many times. 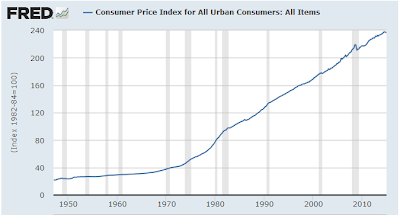 For example, on April 26, 2006 in A Look At Hyperinflation, I stated "Center cut pork chops not on sale are $5.49 lb. Phooey. Who needs that? At least once a month they are on sale for $2.29 lb or less. Seriously, we are talking 1970's prices [on chicken]. I know because I worked as assistant manager in a grocery store back then. Heck I have no idea how they can even raise chickens at .49 lb. If you know then please tell me!" Chickens were a loss leader at $0.21 a pound in 1970. They were $0.49 when I wrote that. In regards to pork chops, I have made similar claims in 2007, 2008, and 2011. And here we are again, back at $2.49. But what about beef? 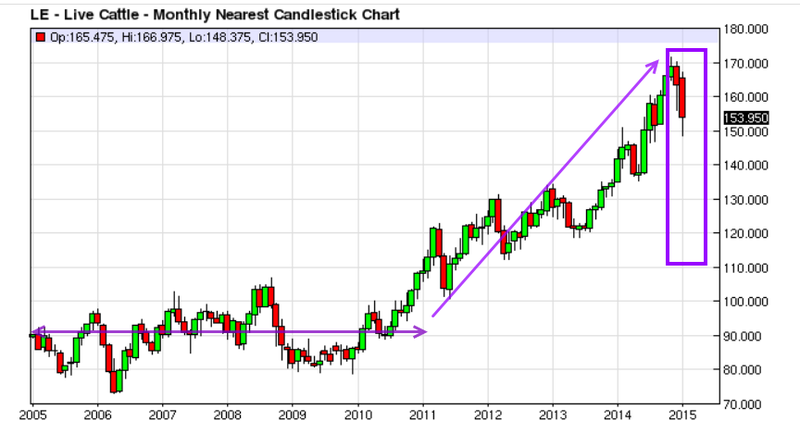 Beef prices are high because cattle prices are high. But, for the first time since the beginning of 2013, prices are down two consecutive months, and there is plenty of room to drop. Why are pork chops back to $2.49 again? Here we are once again. From 2011 until the beginning of 2014, center cut pork chops sale prices were higher, in the range of $2.79 to $3.29 a pound. Welcome back $2.49. We missed you. Not on sale? Don't buy them, or buy them sparingly. 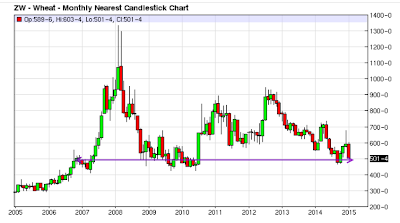 Wheat is back to where it was in late 2006. 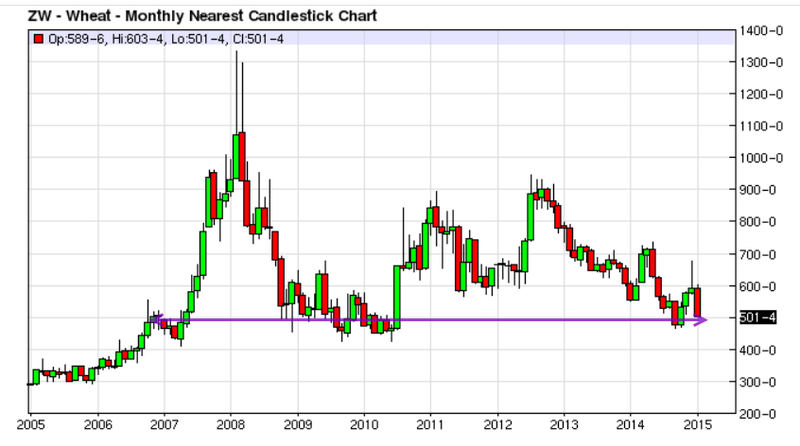 Soybeans are back to where they were in late 2007. 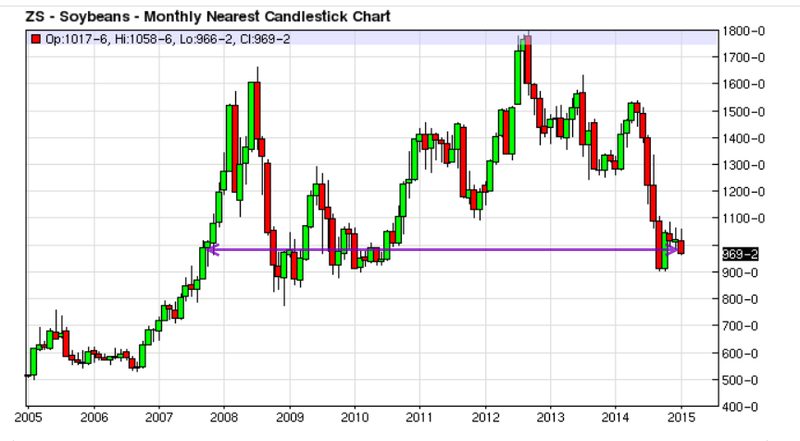 There's considerable room for prices to drop to 2006 levels like the other food commodities. Buy a freezer and use it! It is crazy to pay $5.49 for chops when you can get them for $2.49. It is equally crazy to pay $10.99 for prime rib when you can get it for $7.99. Butter, bacon, and cheese all freeze well. Cheese is often half-price, so is bacon. If you are a vegetarian you have a harder time, but I hazard a guess a freezer or pantry can still come in very handy. Learn to shop! No one can say, but it is pretty clear that food commodity prices are falling and food prices should drop with a lag. 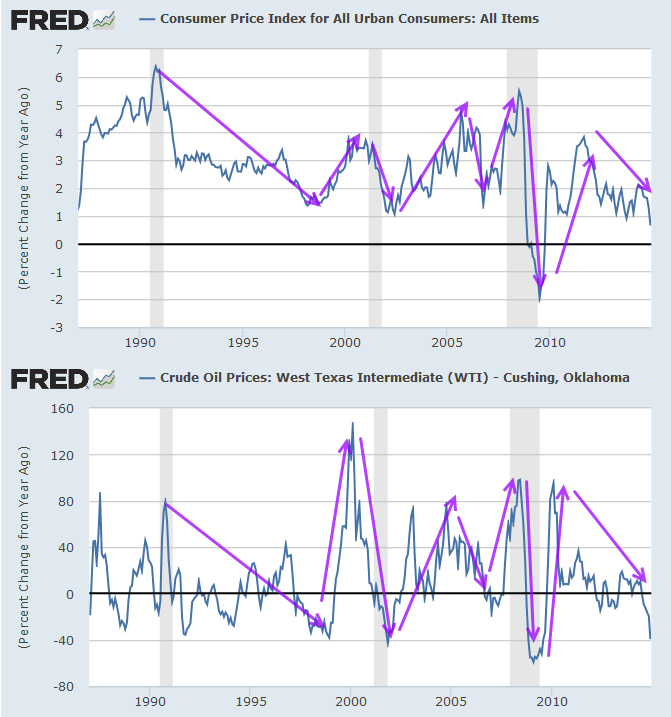 If rent prices drop as well (I do not expect that, but it easily could happen), then the CPI could turn negative once again, even if oil prices head back up. 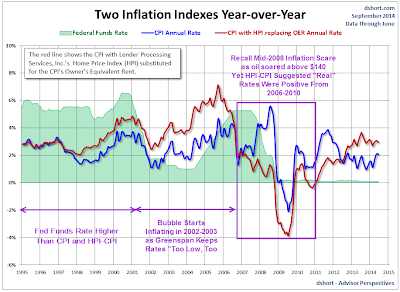 My preferred consumer price measure is HPI-CPI a self-designed index that includes actual home prices instead of rent. By that measure, we will be soon back in price deflation if housing prices drop, and I believe we are on the cusp of another housing decline. Here's the chart. See the article for discussion. 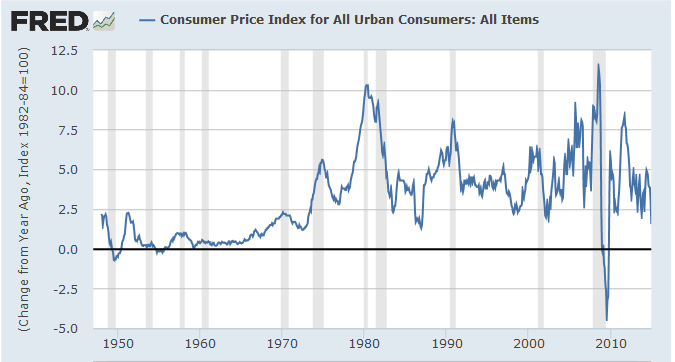 The important thing is credit deflation, not the myopic central bank focus on consumer prices. I do expect credit deflation and a tightening of lending standards once elevated asset prices plunge. The plunge in US treasury yields in the face of expected Fed hikes lends credence for the above analysis. One more point: Please don't tell me about shadowstats CPI. It's a thoroughly discredited model. For analysis, please see Wading Through Molasses: "Did the Real Economy, Not Counting Government, Expand in Last 20 Years?"